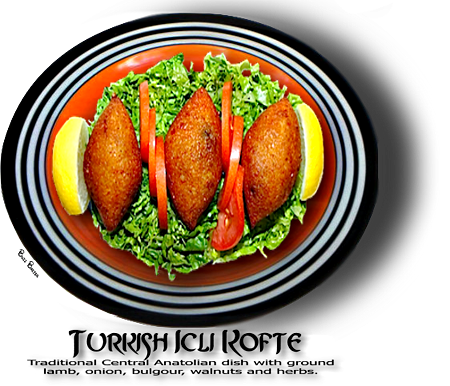 Fineground lamb and bulgour stuffed with an aromatic filling and shaped like a football. These little gems can be fried, served in a broth as as soup, or sliced and fried with scrambled eggs as as frittata. 1. Boil bulgur in plenty of water until soft. 2. Drain and set aside. 3. Melt butter and lightly brown chopped onions and pine nuts. 4. Add 1½ pounds of meat and sautè until juices evaporate. Remove from heat. 5. Add pepper, salt, cummin, crushed walnuts, currants and choped parsley. Mix. 6. In a large bowl, combine the remainder of meat with the bulgur. Add cayenne pepper and egg. Mix and knead well. making a large cavity. Stuff the cavity with the meat mixture,press hole with fingers to close. 9. Add meatballs to salted boiling water and boil for 5 minutes. 10. Remove and drain on absorbent paper. Heat oil in frypan and lightly fry meatballs until golden brown.